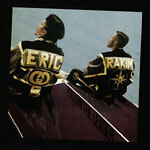 Legendary hip-hop duo Eric B. and Rakim's second album Follow the Leader from back in 1988 gets a re-issue on vinyl! This follow up to Paid In Full was proof that hip hop was ready for a change as it broke out of its early 80's formalities and prepared us all for the 90's! Of course hip hop fans love to reference the Golden Era when it comes to the classics but to truly respect the art form as it changed before our very eyes and ears you have to go back and grab some of the late 80's freshness that broke all the rules, reminding the world that hip hop was here to stay. Word!